You probably hear the term 'mindfulness' being thrown around a fair bit. But do you know exactly what being mindful is? "Mindfulness is all about paying attention to the present moment," Kay Watts, Smiling Mind Education Manager told The Huffington Post Australia. "It is consciousness when paying attention to your experiences as they unfold, moment by moment. Mindfulness is a form of meditation which physically changes the structure and function of the brain to improve the quality of both thought and feeling, whilst also promoting positive mood and building emotional resilience." Used to combat stress, anxiety and sometimes depression, mindfulness is about learning to be in the present so that pain from the past or fear of the future can't consume your thoughts. 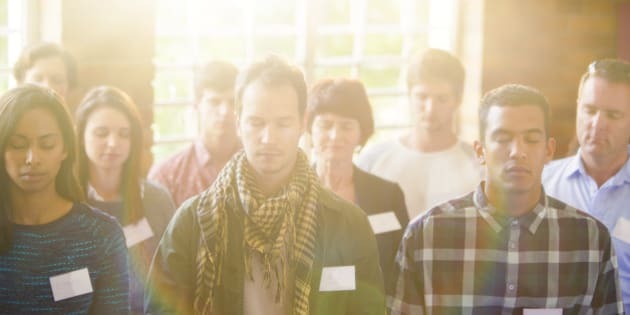 "Daily practise of mindfulness results in a greater sense of calm, clarity, connection, increased productivity and reduced symptoms of depression and anxiety," Addie Wootten, CEO of Smiling Mind told The Huffington Post Australia. It sounds simple enough, though putting it into pracise can be tougher than you might think. For that reason, Smiling Mind -- an organisation which promotes the use of mediation in young people -- is kicking off their first community workshop in Melbourne which is an introduction to mindfulness. "Our ‘Mindful mornings with Smiling Mind’ is a community workshop that is a great touch point to meet some of our audience, provide a quality workshop to introduce the concepts around mindfulness and meditation and further extend participant’s mindfulness journeys," Wootten said. "Smiling Mind delivers workshops within schools and businesses across Australia, however this is the first community workshop where passionate individuals can attend on their own accord. By individuals in attendance, we hope that they might be empowered to approach their school, workplace or family to spread mindfulness and Smiling Mind within their network. "The workshop will firstly introduce participants to mindfulness as a whole, to ensure participants gain an in-depth understanding of mindfulness and its varied uses." The workshop will highlight the physiological benefits of mindfulness that includes changing the structure and function of the brain, how practising mindfulness can help you combat daily stressors, how to connect with breath, body and mind to find a sense of calm, and how to apply mindfulness in your working life to increase productivity, amongst other things," Wootten said. The hope is that the two hour face-to-face workshop will be rolled out in other cities.